This implies that the task will be challenging from a technological point of view, but there is guidance for tuning matching approach that needs to be taken into account. The paper describing the datatset construction methodology is TaxME 2. The node matching tasks are represented by pairs of OWL ontologies, where classification relation is modeled as OWL subClassOf construct. 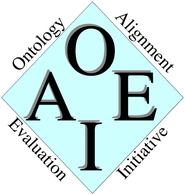 Therefore all OWL ontologies are taxonomies (i.e., they contain only classes (without Object and Data properties) connected with subclass relation. The dataset can be downloaded from here. The matching tasks are numbered from 1 to 4639. The tasks are the same as previous years but randomly shuffled. Thus, for example, the first matching task is to find a mapping between 1/source.owl and 1/target.owl and to output it to a file called 1/yourname.rdf. Results of the alignment should be represented using the common format for alignments and send to Juan Pane for evaluation by September 1st. Quantitative indicators of matching quality (Precision and Recall) will be returned to participants till September 15th. The complete schedule of the event can be found here. Results of the alignment should be represented using the common format for alignments. Results should be sent to Juan Pane . Initial location of this page: http://www.disi.unitn.it/~pane/OAEI/2008/directory/.